This ring bearer seemed to be the only one who noticed our camera peeking over the balcony for this overhead shot. His pleading look almost seems to ask us for help; he obviously didn't sign up for having four adults adjust his clothing and pin his boutonnière just before the beginning of the ceremony. 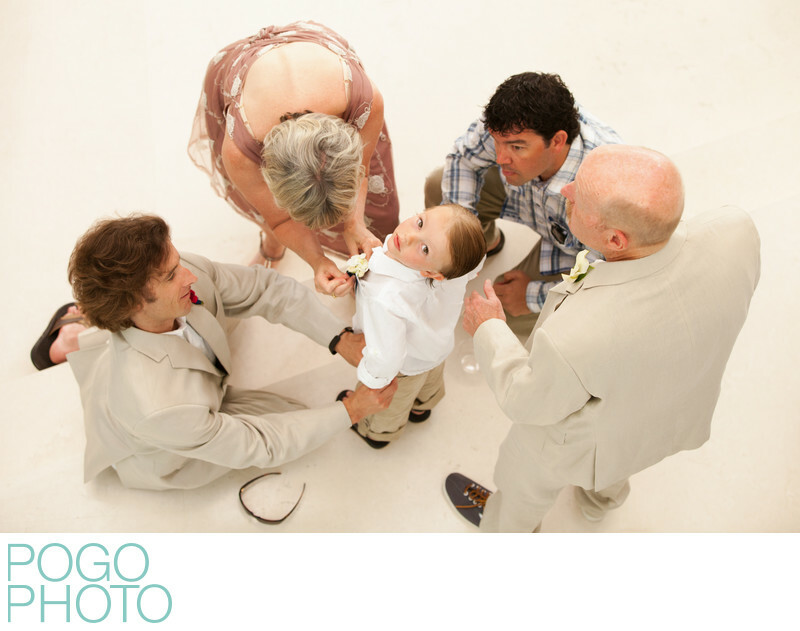 We love honest and genuine photography, and this shot is a great example of the inadvertent humor that can come from having young children involved with any wedding day. We do our best to fly under the radar so that we aren't noticed, but kids usually notice us anyway! There’s something alien about photographers documenting the day while the adults pretend to ignore us, and young ones sometimes latch on to this unusual situation. The clean color palette of this image, comprised of mostly neutrals and muted shades of maroon and blue, is enhanced by the smooth expanse of off-white marble flooring of this private home at the southern tip of Jupiter Island, just off the coast of the small seaside town of Jupiter, Florida. Choosing to shoot from overhead has its advantages: seeing a different perspective than many guests or even our clients might notice, and becoming nearly a fly on the wall in terms of who might notice where we are. 1/125; f/4.0; ISO 640; 70.0 mm.